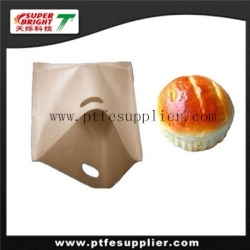 Non-stick toaster bags, made of PTFE coated fiberglass, are typically designed for all kinds of toasters. No mess, low oil, green, eco-friend, healthy life and energy day. These are the main purpose that we want to share with our friends and families. The non stick toaster bag with its non-stick surface cooks snacks for you in just a couple of minutes, retaining all their flavor and vitamins. Toasted sandwiches, pizza slices, panini, pita, garlic bread, bacon and more. Your toaster or grill will remain clean. Toast-it is also suitable for use in all types of toasters, grills, toaster ovens. Turn your toaster into a grill with Toaster Bags. Slide a sandwich into the non-toxic, non-stick bag and toss it in your toaster. Within minutes, you'll have a perfectly toasted and delicious sandwich. Ham sammies, grilled cheese, paninis, pitas, garlic bread, pizza slices, and even bacon can be cooked in your toaster. Each Toaster Bag can be reused up to 50 times and you get two bags with each order. Heat resistant up to 500°F, Toaster Bags can even be used on your indoor grill. Your toaster and grill will always remain clean when you use Toaster Bags. 1) Hardly to adhere any material; it is easy to wash away the blot or other dust such as resin,coating material, could beused time and again. 2) Proofing the oil flow to the bottom of oven when being roasted. 4) It could be used safely in the dishwasher, innocuous, and could be contacted the food, with antisepsis function. 7) Complies with Food Regulations. 4. How to use reusable, dishwasher-safe bags ? Prepare your grilled cheese sandwich as usual and place it inside a Toastabag. Place it, with the opening facing upwards, in your toaster. Switch the toaster on and your grilled cheese sandwich will be ready in less than three minutes.